The mission of InnovationMain is to provide uncommon insights, strategy and solutions with proven processes that drive Creativity and Innovation at your business, create real market growth and success for your products and services, and achieve market leadership. We make innovation a sustainable competitive advantage, inspire you to build an innovation factory, effect and manage change, and accelerate your business. We have considerable experience and expertise in working with small, growing and established companies, product and marketing departments, and innovation teams. InnovationMain - Creativity and Innovation Driving Business is an Irvine Chamber of Commerce Member in Orange County, California. Creativity And Innovation Driving Business is honored to partner with University of California, Irvine, The Paul Merage School of Business towards offering the accelerated Innovation Bootcamp as part of the Strategic Innovation Class. Sanjay Dalal is an Innovation Author, Innovation & Marketing Speaker, Social Media Entrepreneur and Community Leader. Dalal has over fifteen years of leadership experience in Silicon Valley and High Tech companies. Dalal authored and launched the Faculty eBook and Definitive Guide on Creativity and Innovation in Business in 2008, now used by over 1,000 leading organizations and professionals all over the world including HP, Hallmark, Cleveland Clinic, Pepsi, EDS, J&J, Nokia, LG, SAP, Tata, major universities and more. Dalal published over 250 articles on the real-time state of innovation in business at his blog Creativity and Innovation Driving Business, and introduced the Innovation Index in December 2006. The Innovation Index correlates Innovation, Business and Stock performance. Dalal launched the innovative investment company, Innovation Index Group, that invested in the Top 20 Innovators of The Innovation Index. Dalal filed joint U.S. Patent on "Hands-On Labs" for delivering live, hands-on training over Web Meetings by simulating a training lab environment. Dalal has launched innovative products such as Cisco-WebEx Training Center and Cisco-WebEx Sales Center to market, and grown product line revenue to tens of million dollars in annual revenue. Dalal holds executive certification on Leading Management Teams from Cornell University, and is an engineering scholar graduate in Electrical Engineering (Computer Engineering) from The University of Texas at Austin. Dalal attended Arizona State University for graduate education in Computer Science. Dalal secured the first position in the 50th William Lowell Putnam Math Competition. Dalal volunteered as basketball coach for Irvine NJB, Ranch Middle School and Fremont NJB for his son's teams, as an art master for 2nd graders for his daughter's class, and as the secretary and treasurer of the Turtle Rock School Site Council and PTA respectivly. Dalal was a member of the Technology Advisory Committee for the Fremont School District, an appointed position by the Fremont Board of Education, to create a Technology plan for 40,000 students. Dalal was a Web 2.0 adviser for Cal State Fullerton, Extended Education. Dalal was an appointed member of the Dean's Leadership Circle of The Paul Merage School of Business, University of California, Irvine, and a guest lecturer at the University of California, Irvine for the Strategic Innovation class. Dalal is the Board Member of Asian Business Association of Orange County, Member of The Indus Entrepreneurs & Member of the Rotary Club of Newport-Irvine. Dalal is the current CEO & Founder of oGoing, an enterprising startup in social networking for business, and founder of India Business Network USA. Complete Profile of Sanjay Dalal can be found here. Sanjay Dalal is elected as the President-Elect for Asian Business Association Orange County - ABAOC. Dalal will create new opportunities for small business owners, entrepreneurs, startups and emerging businesses in Orange County. Sanjay Dalal is appointed as the Director of New Generations for the Rotary Club of Newport-Irvine. Dalal will help drive programs for youth at local high schools and universities during 2011-2012. Sanjay Dalal launches Ogoing Small Business Social Network - focused on helping USA small businesses, entrepreneurs, startups and SMBs. Ogoing has helped promote over 1,000 businesses who have joined during the initial launch. Business Innovation eBook, Innovation Bootcamp On Demand Resource Kit and Apple's Innovation Strategy increases customer base to 1,500+ businesses & innovators worldwide. 2nd Edition of Apple's Innovation Strategy is released at InnovationMain. WOW! Product Guide is released worldwide on Amazon.com. Sanjay Dalal delivers keynote speech at Dassault Systemes, Paris, France on the topic of "Creating Right Products at the Right Time - Amazing Products that WOW your Customers NOW!". Over 500 attendees included senior executives, founders, product directors, product managers, UI design manager, and design engineers. Business Innovation eBook and Innovation Bootcamp On Demand Resource Kit increases customer base to 1,000+ businesses & innovators worldwide. 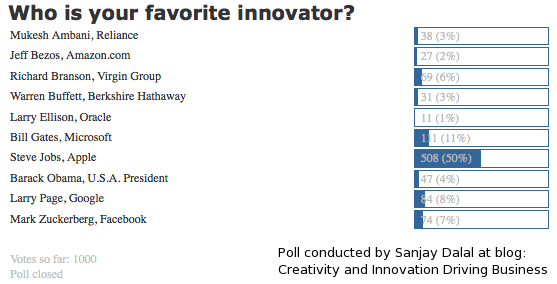 What drives creativity & innovation at your business? Do you have what it takes to deliver successful, "killer" innovations? What are some do's and don'ts? What are the key processes? What is your innovation culture? Sanjay Dalal launches SenVet - a new social network for Seniors & Veterans. Sanjay Dalal volunteers on behalf of Rotary Club of Newport-Irvine at the Irvine Senior Job Fair and the Annual Woodbridge Cross-Country Classic. Sanjay Dalal begins his one year volunteer position as the Treasurer of the Turtle Rock Elementary School PTA. Sanjay Dalal begins his one year volunteer position as the Fine Master of the Rotary Club of Newport-Irvine. Sanjay Dalal launches India Business Network - Premier network of professionals who connect, collaborate & do business with Indian professionals worldwide. InnovationMain.com and Sanjay Dalal deliver over 1,000 hours of live and on demand Innovation Bootcamp workshops. BusinessWeek Blog: The Innovation Bootcamp Jumpstarts Business Innovation And Growth..
PRATHAM - Where every child in India can aspire to read, learn and write. In India, illiteracy is the biggest reason for poverty (more than half of India is poor). "The USO is a private, nonprofit organization whose mission is to support the U.S. troops by providing morale, welfare and recreation-type services to our men and women in uniform." "ChildFund International is inspired and driven by the potential that is inherent in all children; the potential not only to survive but to thrive, to become leaders who bring positive change for those around them." "FWM shares concern for the poor, especially those with physical immobility. The chairs are distributed free to those in need, regardless of one's religious affiliation if any." Helping the needy in the U.S. with food, shelter and warmth. "Kidsave works to draw attention to the plight of institutionalized children and the need for every child to have a family or a caring mentor." "Snowball Express started in early 2006 with a simple idea: America should honor and pay tribute to the children of those military fallen heroes who have died while honorably serving since 9/11." "Big Brothers Big Sisters is the oldest, largest and most effective youth mentoring organization in the United States." "Since its founding in 1881 by visionary leader Clara Barton, the American Red Cross has been the nation's premier emergency response organization." "Founded by Sanjay Dalal, chief innovator, its vision is to promote and support strong bone health in children, youth, and young adults, thereby preventing Osteoporosis in later life." Dalal Family has also donated to Irvine Police Foundation, Veterans Organization, Cancer Research, CHOC Orange County, California Fire Fighters, California Police and Sheriff organizations, Katrina Hurricane, China Earthquake, Japan Earthquake, Mid-west Tornadoes, Tsunami Relief, Myanmar Floods, School PTA and more. Sanjay Dalal is an active community member of the Rotary Club of Newport-Irvine.